It’s amazing how much a single yard structure can add an extra element of weather protection and physical beauty. If you have the resources and yard space available, a pergola can serve as a useful and aesthetically pleasing resource for your garden or yard. The wonderful thing about pergolas is that there are multiple places where it would be appropriately set. If you have a deck or other structures in the yard that could use shelter from the rain or snow, these might be an ideal place to build one. 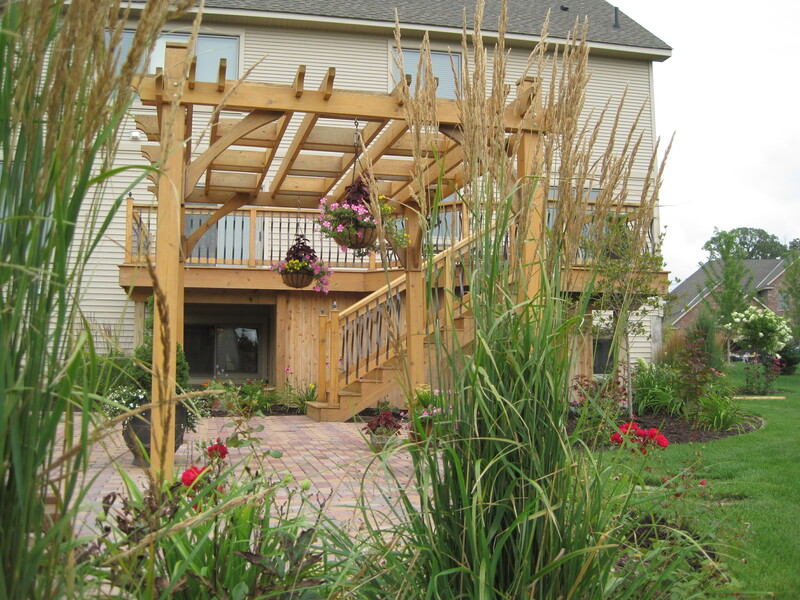 You can construct a pergola over your deck so that you can go outside in most weather conditions. Snowy conditions can be a problem for many Minnesotans during the Winter; no one likes shoveling snow off their patio. If you have the proper roof structure for protection, this doesn’t have to be an issue for you anymore. Keep in mind that the site of your pergola will determine the right type of form it will take. You might find it useful to build one over your garage, over plants, or near the perimeter of your pool if you have one. Pergola’s aren’t limited strictly to patios. Many areas around your home could benefit from being sheltered by one. If you are looking to add beauty to it, you can decorate it with flowers, vines, or other vegetation. Vegetation can be great for pergolas that serve as carports. In this case, it’s possible that the roof of the pergola could have gaps in between the building materials. Vines or flowers growing in between these gaps not only makes the pergola prettier to those passing by while providing adequate protection from rain and snow. This added beauty also applies to flower beds or other areas of your garden. The foliage complements these areas nicely and allows for them to be exposed to the necessary amount of sunlight while protecting them from the potentially harmful weather. Traditionally, the most complex pergolas are usually built around larger areas like patios, hot tubs, and swimming pools. These can sometimes serve as rooms of their own, especially if they are designed with Winter weather protection in mind. If you have a simple bench or porch swing somewhere in your yard, a small pergola can be a nice addition to it. This can keep you cool during the warmer months when you are sitting out in your yard or on your deck. These can be nice if you plan on going outside in colder weather. Minnesota is known for its harsh weather during the Winter months. If you have a hot tub located outside, a pergola might be necessary to provide adequate protection and enjoyment during the coldest time of the year. Even if your home doesn’t include any room for these type of amenities, a pergola can still improve the physical appearance of your yard. Even the simplest of pergola designs can stand out if they are well-constructed and appropriately placed. Depending on the size of your ideal pergola as well as the purpose it will serve, you’ll want to consider the monetary amount that you would be willing to invest in this type of home project. If the idea you have in mind is smaller and simpler, you might be able to build it yourself. Building materials can add up in terms of cost and labor for constructing this structure. If you do not own a house with one already pre-built, you will find that the total cost for constructing a pergola is going to be in the thousands of dollars range. Constructing this yourself is a wonderful way to save labor costs for a company to build it for you. Keep in mind that you will need to possess a certain level of skill, depending on the style and size of your pergola. If you have the financial resources available and are looking to spruce up the look of the exterior of your home, you might find that a pergola can be well worth the cost.